The airport of Alicante-Elche (IATA code: ALC, OACI code: LEAL), also known as Alicante-El Altet, El Altet airport, or Aeroport d’Alacant –Valencian language–, is located at 8 kilometers southwest of Alicante city center. The diversity of names of the Alicante-Elche Airport comes from its geographic situation. It is located in the province of Alicante, within the municipality of Elche (Elx, in Valencian language). Due to this privileged geographic situation of high touristic interest, the Alicante-Elche Airport operates mostly international destinies. 80 per cent of its passengers are international travelers, the majority coming from Great Britain, Germany and The Netherlands. With reference to national destinies, the flights from / to Madrid airport, Barcelona airport and Palma de Mallorca airport, are the ones with the mayor number of connections. are the ones with the mayor number of connections. With regard to the amount of passengers and cargo, this airport occupies rank six among all Spanish airports, outdating even Valencia airport, within the same Autonomous Community and Capital. It also belongs to the 50 first European airports. Within the extended touristic area of the Alicante-Elche Airport at the Costa Blanca, and above all within the provinces of Alicante and Murcia, Denia and Mazarrón, you will find famous cities as Benidorm, Calpe, Denia, Jávea, Torrevieja, La Manga del Mar Menor, Orihuela, Murcia and Cartagena. 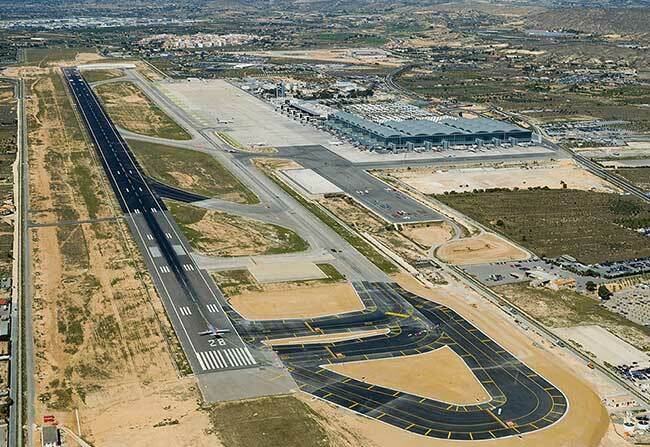 In other words: There is a guarantee for the future of this airport and for an industrial and agricultural growth of other important cities as Elche, Novelda, Alcoy, Elda-Petrel, Ibi, Villena, or even the Autonomous Community of Albacete. The latest renovation of the airport was done with the construction of the “Nueva Área Terminal” (NAT), the new passenger terminal, capable to serve up to 20 million of passengers per year. This refurbishment, however, delayed important improvements of the rest of its infrastructure. The new Alicante–Elche terminal celebrated its inauguration on March 23rd, 2011. With the launch of this terminal, the older terminals T1 and T2 remained out of service. They are being used, though, depending on the needs of the amount of passengers. Terminal NAT, level 0, Arrivals hall. Monday to Friday, from 9h to 14,30h (except holidays). Handling companies: terminal NAT level 0, baggage claim hall. The coordinates of the airport premises are as follows: 38° 16′ 55.81″ N, 0° 33′ 29.36″ O. The ICAO/OACI code is LEAL and the IATA code is ALC. The airport has two runways with alignment 10/28 (101°/279°), length of 3.000x45 meters (9.842x148 feet) at 43 meters above sea level. The airport has one terminal buiding for passengers para pasajeros knows as Terminal NAT. Also has two former terminals (T1 and T2) currently closed, but could be open if necessary due the air traffic. Aeropuertoalicante-elche.com offers information to visitors, related to the Alicante-Elche airport, but has no direct or indirect connection with AENA, the administrator of the biggest part of the Spanish airport network. For further explanations about flight schedules, connections, Immigration services, airlines and/or luggage, please send an e-mail to the following address alcinfo@aena.es. If you wish to contact aeropuertodemalaga-costadelsol.com, please send your message to web@aeropuertoalicante-elche.com. If you wish to advertise yourself on billboards within or outside the airport premises, please contact alcinfo@aena.es.